Whispering undulations echo a dynamic trek across diverging terrains and cultures. A lulling calm courses through a vibrant coalescence of adventure and impression, observance and immersion. The Missoni Man SS19 Collection encapsulates this physical and spiritual odyssey, tracing the path of the initial Paris-Dakar Rally of the late 70’s. Whispering undulations echo a dynamic trek across diverging terrains and cultures. A lulling calm courses through a vibrant coalescence of adventure and impression, observance and immersion. The Missoni Man SS19 Collection encapsulates this physical and spiritual odyssey, tracing the path of the initial Paris-Dakar Rally of the late 70’s. It becomes a narration identified only by the imprints of experience, characteristically expressed through colour, texture and pattern. This season’s colour palettes move from verdant fields to golden deserts as reflections of alternating landscapes and memories; while the overall collection reveals a worn and weathered patina. Sandstone and electric citrine stream through expanses of olive green, medallion gold and lac-rose red. Racing yellow and bleu de France cut across stretches of midnight blue, bright green and cerulean. Cascades of multicoloured space-dyes emerge as illuminating storms of colours and as moments of celebration. Layered silhouettes reflect a contrast of extreme proportions and an amalgamation of the Missoni Man’s transformative journey. Softly tailored double-breasted suits in lightweight loom-knit fabrics give way to slightly more disheveled, put-together looks that take on a more ethnic vibe and styling; mixing and matching elongated intimo pieces with oversized shawl-collar cardigans, polos and V-necks, field jackets and nylon pullovers, cutaway collar or pajama shirts and relaxed linen trousers or cargo shorts. A mix of artisanal creations and innovative techniques, stitches and prints illustrate Missoni’s unparalleled craft in knitwear, and its art in storytelling. Irregular vertical stripes and bold, graphic chevron patterns mix with ethnic-inspired tire-track prints on fluid, shiny viscose and hand-painted macro checks printed on thin, crinkled nylon. 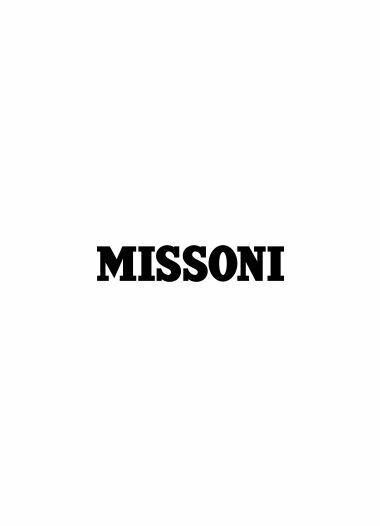 Missoni’s exclusive woven fabrics are flecked with space-dyed yarns and over-dyed for a mal tinto, marbled effect. Jacquard designs are inspired by the artisanal techniques and patterns of West Africa and include bicolour flag motifs, dégradé tuck stitches and embroidered fringe checks. Moss-stitch knits are contrasted by multicoloured borders and trims. Sprayed double-breasted jackets with kimono sleeves and racer pants in nappa leather are hand-painted in the same tones and distressed for a worn-in, gradient effect. A racer boot fashioned from a patchwork of braided nappa leather and suede are treated for a similar washed-out effect and a classic crocodile-printed leather moccasin with antique brass buckles complete this multifaceted collection that becomes the celebration of a journey’s end.